​If you're looking to add some of that rustic charm to your home with a custom wood sign, we got you covered. The best part is - you can design it any way your want, and you can make as many mistakes as you want ('cause it's supposed to look old & weathered anyway). ​And while you can buy rustic signs in most places right now (although I find them to be quite overpriced), what's the fun in that? You can build one of these signs in a few hours, on a small budget, and impress all your friends with your new antique-building skills! Finally, if you're feeling a tad bit creative - I like to borrow ideas from all these different builds and come up with something totally unique. So don't be afraid to try something new. 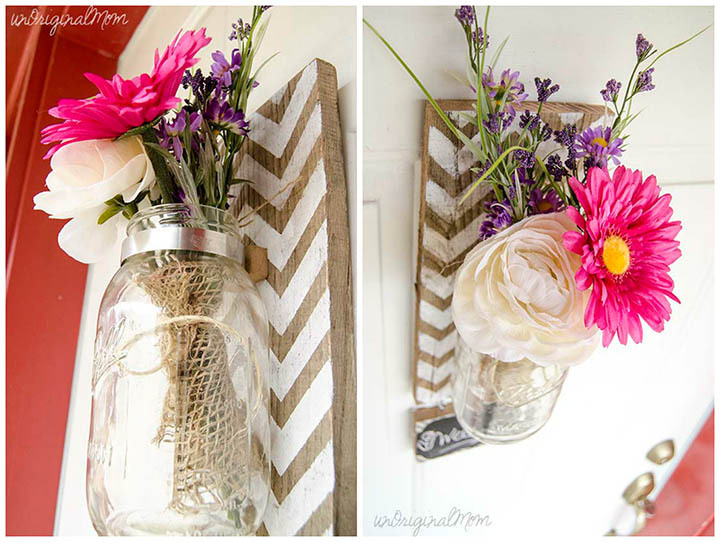 ​Here's another really clever (and super easy) method of creating a rustic sign. Simply take a trip down to Michaels and find yourself an assortment of letters, and pin them to a backboard of your choice. You can paint or sand or wear the letters, and have them spell out anything you like. Ribbons and Glue made​ this very personalized State Sign, using stencils to draw out the 3 states they lived in over the years. Of course, you can paint whatever is meaningful to you by cutting out some stencils. ​I'm a real sucker for these rustic chalkboards, it reminds me of visiting my hometown's family-owned ​restaurant growing up. Did I mention how dead simple this sign is to make? ​No power tools required! ​A wood board, some chalkboard paint, and some stain and you're all set. ​Now we're getting into some serious sign-making. Pallet signs require you find an old pallet (crazy, I know). If you visit any home renovation store or warehouse they tend to have a couple of pallets destined for the garbage that they'll be glad to hand over to you. Making for a seriously budget-friendly project. ​Do you believe in love at first sight? This sign might just be the key to your creative heart. It's so beautiful and unique, and as always - super simple to make. All husband's out there need to take note - this is the ultimate homemade gift for a birthday, anniversary, or valentine's day. ​Sometimes simple is better: this is just a stained piece of wood with some ​traced on lettering - but the final result is beautiful. This is a perfect piece to put right above a doorway or window. ​This project is a little more involved, but if you're feeling your inner decorator/carpenter then it's time to get start on this ambitious sign. Thankfully these guys take you step by step through the entire project, so you'll have something worth feeling proud of by the end. ​Another deceptively simple creation that you can have up in no time. A little painting, sanding, and tracing and ​you're done! ​You're probably starting to notice a common theme here - you can take a piece of wood, paint it, trace on some lettering, and sand it down for that weathered look. And while a few of these projects are similar, they all have their own unique style to give you more ideas. ​Another simple sign, but I really like just how weathered this one looks, and how well it matches the coloring of their kitchen. A perfect match. ​This project is a little different, because there's no sign building here (well, not exactly). Instead, we get a tutorial on how to distress wood to give us that nice rustic look. This is perfect for your sign building ambitions, and allows you to freely create anything you like. ​This blog is literally called How To Distress Furniture, which is pretty much what we're after - so I recommend snooping around their other posts. In this case we're building this ​weathered christmas themed sign. ​What I like about this sign is the little details to make it feel truley distressed. Sanding away the paint and chipping the corners gives it an authentic look. ​I absolutely love, love, love this piece. And whether or not you live in the USA doesn't matter, because you can fit in any letters you like (I ​spelled out "boy" and "girl" for my sister's children and their bedrooms). Either way, this is a masterpiece and easily one of my favorite home projects. ​An absolute masterpiece. If you're feeling a little bit more ambitious then I definitely encourage your to take a stab at this piece. I made two of these myself as Christmas gifts to my family, and they absolutely loved them. ​Need some more pink in your life? (who doesn't). Here's a clever little exit sign with some weathered paint. What makes this so clever is the two layers of paint, look closely and you'll see hints of baby blue peeking through the pink. ​A wood sign with a twist! Hanging a jar onto your sign allows you to fill that space with any seasonal item that you please. Spring time? Fill it with flowers. Christmas? Fill with cranberries, evergreen needles, and ribbon. Fall? Alright... you get the idea.